Companies allow you to organize a group of users under a single company name, granting them access to each others discussions and allowing for a shared support environment between you and the Company. You do not need to create a company for your own company, i.e., support staff. Every member of a company gets access to all discussions belonging to the company. 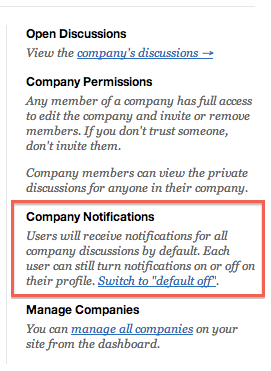 Every member of a company gets notified about discussions belonging to the company. What is a company discussion? Created by a member of the company. Replied to by a member of the company. Watched by a member of the company. More specifically, when a user, member of a company, creates a discussion, replies to a discussion, or is added as a watcher to a discussion, the company is added to the discussion as well. 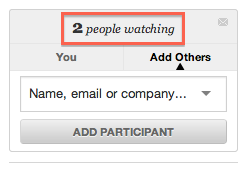 This automatically gives access to the discussion to any other member, and notifies any other members.